I usually make my calls in my office. Thank you. I use my cell phone the most in my bedroom. When I’m home, I mostly use my cell phone standing outside to get a better/stronger signal, which is not convenient when it rains! This booster would keep me out of the rain! I would like a stronger cell phone signal in all the rooms in my house. We live in a remote area where cell phone signal isn’t always that great. Some day’s we have signal on the west side of the house and some day’s on the east side, never a consistent signal. 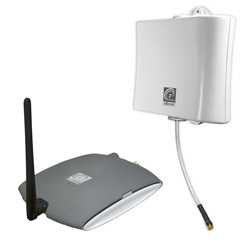 A cell phone signal booster would be a huge bonus in our house! I use my cellphone the most in my home office. Cell phone can only be used in the living room. We use our cell phones mostly in the living room. I rarely use my cell phone at home since the reception is poor. I live in an area surrounded by many major communication antennas - we often can’t get some radio and TV stations. This would be so great to have so I can know I will hear and be heard on my phone. Death Valley is what old CBers called this area. Most of the rooms in our old (sheet-metal roof and walls) trailer (yes, we are trailer trash) have barely-there to dead-zone coverage, but my “playroom” is where I usually am when calls come in. The only window faces away from the nearest cell site, and I only get coverage when the stars align and the solar wind is right. Life in rural Tennessee! In the living room, definitely. not with AT&T in my house. I use it most in the office. In the kitchen because I can barely get it to work anywhere else in the house. All over the house, but especially in the Family Room. We do not get good reception in our home, so this would help a LOT! Thanks! I’d use it on the main floor of my house - living room, kitchen and dining rooms. I have to stand by my windows to get receiption. I want a better signal! I use my cell in my home office and with a metal roof and cinder block construction the signal can fade out easily. This would be great benefit! I would mostly use it in the kitchen and Living room, as it is I have to use my cell phone outside in the driveway to get a signal! Right now we use our cell phones pressed up against the bedroom window to get two bars. It would be great to talk in other areas in the house. Most often from my couch, in the living room. I would like to own one, so I can use it in my bedroom for emergency night time calls…. What a great product. The cell service in my home is poor. It is worse downstairs, so I would put this in the living room. The garage. I practically live out there. I use my phone in my bedroom. I use my cell phone most in the bedroom. I get soooo frustrated with my signal at home…I sure wish I could easily get online/email in my KITCHEN especially…where I spend most of my time…but I’m not cooking! I use mine in my living room the most. There is one single spot there I can get my signal. I am a subscriber with same email and liked the facebook page. I use the phone in my bedroom lounging, but live in the mountains and often have bad reception. I live in apartment surrounded by lots of tall trees, so I get a signal, but not a strong one. I’ve had the occassional dropped call, and downloading updated for apps takes forever, so I need a boost - in my living room! We use our cell phone in the living room & mostly we are afraid to even move or we will lose the signal. Where would i use it. In the living room mostly. We have terrible cell reception here. 1 or 2 bars at most and that’s if the wind is blowing just right.. I need this at work. I work at the end of a causeway near the breakwater at the Port of LA. There are no cell towers around and my signal is spotty at best. I get poor reception throughout my house, especially the living room. I am a fan of the Wi-Ex zBoost Facebook page. I would use the signal booster in my home ofice. room cell phone used in? I use mine most in the sunroom as the reception is best there but it kind of tough going in the winter when the room is cold. Brrr! I would use this in my bedroom. I think this is a great item I live in an apt building and I don’t get signal at home so this would be a great thing to have so I can use my unlimited minutes after 9pm. I am a long time subscriber. Thanks for the giveaway. I use mine in the basement.